WALL•E (film) Computer-animated feature from Pixar Animation. What if mankind had to leave Earth 700 years in the future, and somebody forgot to turn off the last robot? WALL•E (Waste Allocation Load Lifter Earth-Class), a robot, spends every day doing what he was made for, cleaning the trash-covered planet, but he discovers a new purpose in life when he meets a sleek search robot named EVE (Extra-terrestrial Vegetation Evaluator). EVE comes to realize that WALL•E has inadvertently stumbled upon the key to the planet’s future, and races back to space to the luxury spaceship Axiom to report her findings to the humans, who have been eagerly awaiting word that it is safe to return home. 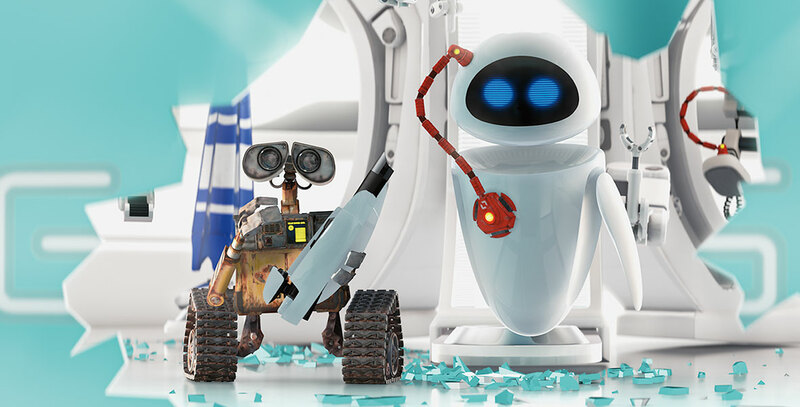 Meanwhile, WALL•E chases EVE across the galaxy and sets into motion an exciting adventure. Released on June 27, 2008, after an invitational premiere at the Greek Theater in Griffith Park on June 21, and a release in Bolivia and Chile on June 26. Directed by Andrew Stanton. Voices include Fred Willard (Shelby Forthright, who also appears in the film), Jeff Garlin (Captain), Ben Burtt (WALL•E), Elissa Knight (Eve), John Ratzenberger (John), Kathy Najimy (Mary), Sigourney Weaver (Ship’s Computer). 98 min. The film features a score by Thomas Newman, with Peter Gabriel collaborating on the song “Down to Earth.” The soundtrack includes two songs from Hello Dolly (Fox, 1969), on a videotape that WALL•E repeatedly watches. Filmed in CinemaScope. The film won the Oscar for Best Animated Feature.